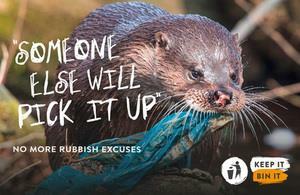 A new campaign featuring the harmful impact of litter on nature has been launched by Defra and Keep Britain Tidy. The Keep It Bin It campaign, which will run across England, is urging people to put their litter in a bin or keep hold of it until they find one. It is backed by major UK businesses including Mars Wrigley Confectionery, Greggs, McDonald’s, PepsiCo UK and Network Rail. The emotive images of wildlife eating and getting tangled in litter represents the 1,500 calls the RSPCA receives ever year about litter-related incidents. To mark the campaign’s launch, adverts will be on display today (30 November) in popular train stations including London Euston, Manchester Piccadilly and Birmingham New Street. It will then feature at till points in Gregg’s stores and at Cineworld cinemas through the partnership with PepsiCo UK. Keeping the country’s streets clean costs local government almost £700m last year in England. Allison Ogden-Newton, CEO of Keep Britain Tidy, said: “We are delighted to be partnering with Defra to deliver the first government backed national anti-litter campaign in a generation. Earlier this year government doubled the maximum on-the-spot penalty for littering, gave councils new powers to tackle littering from vehicles and made £450,000 funding available through the Litter Innovation Found to pilot new ways to tackle littering. One in five people drop litter, according to Keep Britain Tidy research, with 27% admitting to ‘careful littering’ where rubbish is left in promiscuous places such as window ledges.